There are a few quirks, but Netflix's new media player works great in Safari and Firefox. Jason Snell from Macworld has also been playing with the new media player, and you can read his review online. Still, where Instant Watching shines is in its collection of documentaries, classic movies, and TV series. I’ve now got 64 items in my Instant Watching queue, including whole seasons of TV series such as “30 Rock,” “Weeds,” “MI-5,” “The Office,” and “Dead Like Me.” NBC is even making its series “Heroes” available on Instant Watching the day after the show airs on the network. Netflix is still a long way from translating its massive DVD catalog into Internet-streaming videos. And for the latest Hollywood blockbusters, getting the DVD in that little red envelope is probably still your best option. But if you’re already a Netflix subscriber, Instant Watching is an excellent supplement. And now, at last, Mac users are welcome to the party. Could you please let us know if the player can be controlled with the keyboard at all? The previous player could only do play and pause with the spacebar, but there were not keys to do FFW, REW, or fullscreen. This made it very problematic for those who have their PC connected to a TV set and wish to use a remote control. Is there any word on support for Power PC based Macs? Or am I forever SOL? @shrike It doesn't seem like power pc will be available but you can read up on microsoft's silverlight since that is where your compatibility issue is going to come from. Is it just me? or is that a heck of a lot better than the Windows version lol... congrats Mac owners... Waiting really does have its virtues!! 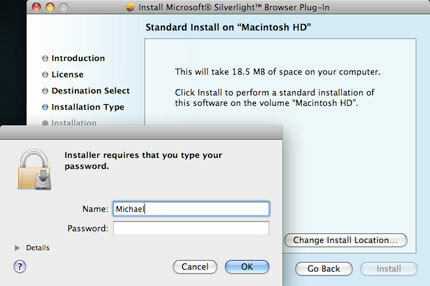 THis is definetly going to be great for MAC users however Im guessing a whole bunch of PC users are going to have problems now with dropped frames in the silverlight player, MACS actually have tested and work better for silverlight than most PCs, so this is definetly an upgrade for MACs and a downground for PC users, sure there wont be as many DRM errors, Connectivity Issues, etc but I see the bigest problem being dropped frames. 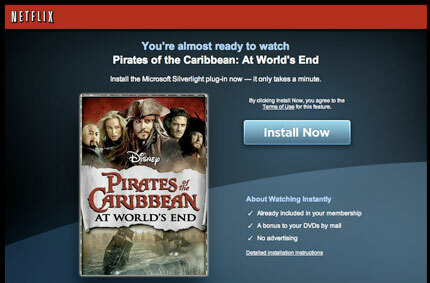 Is there any way to force/trick Netflix into showing us Mac user the Play Instantly available on the Mac. Kinda like when Watch Instantly was first rolled out. I think we could add something to the end of the url and make it show up. Is it possible to control the bandwidth (equivalent to Shift-B in the current Netflix player)? Also, is there an equivalent to the shift-right click status window from the current player, which allows you to see info on the buffering etc.? Who do you have to beg to get on the list? Robert: You've misunderstood the review. It's possible to watch on your external display - you just need to set it as the primary desktop, not the secondary desktop. It's silly, but easy to get around until Netflix fixes it. Unofrtunately Steve like you others believe that they can get on some list and if they go high enough someone in NEtflix will let them in the test cell, unfortunately this is not possible. THe reason for it being a closed test cell is to see how people respond and react to it in a closed enviroment with fewer variables. When people ask and are placed into test cells, typically they have a higher understanding of computers, networking, etc. which is not unforutnatley the average viewer and would skew the reactions and the data collected on issues. There research and developement team need a broader mix of people so thats why it is random and to ask and to whine about not being added is just juvenile. Yes there is a way to alter the bandwidth just the same, just wait around and not to long it will be posted in here its very simple and it also allows for you to adjust the audio stream as well not just the video. Also to JRBlaze unfortuantely there is no trick to get it on its a essentially its an account setting that users don't have access to. gweilo8888 -- Ah, okay, thanks. Do you know how to set an external HDTV (via VGA) as a primary display? I've been checking the error messages for a couple weeks waiting for them to change. If it doesn't work at first after opting-in, try restarting firefox. Now that Netflix has officially enabled the opt-in, I can answer my own question. Shift-B and Shift-Right-Click from the old player don't do anything in the new player. If there's a way to fix the bandwidth, it isn't the old method. Robert: The precise answer to your question depends on your OS and display drivers, but for most people the answer is simply to go to your display properties and change which screen is the primary. In Vista, you do so with the "This is my main monitor" checkbox. In XP, it's the "Use this device as my primary monitor" checkbox. For Mac users, I haven't a clue - but I'd imagine you'll have a similar option somewhere. Conan -- No, making assumptions about people you know nothing about is juvenile. I simply asked an intelligent question, too bad you had nothing intelligent to offer in return. SteveP: It's OK, Conan's already been proven wrong as Netflix has opened the beta to all members (via opt-in). See the story currently headlining this and Netflix's blogs. 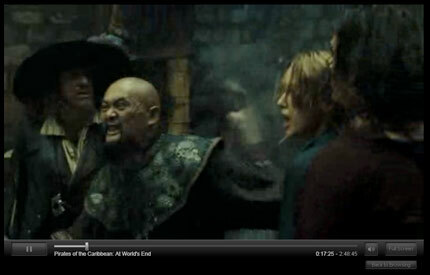 I have silverlight and im in the beta, but it gets stuck at loading video player...any ideas?? your blog is great, I felicitate I come across it.